Greeting friends! Thanks for stopping by today. I'm sorry I haven't been around the blogosphere much lately. Life is pulling me in other directions these days. Once things settle down a bit, I hope to get back in the swing of things. I've certainly missed you all! My question for today: Do you have a summer vacation planned? If so, where are you going? I was hoping to visit my family's cottage again this summer. It's so peaceful and beautiful there, on Lake Michigan, what a treat! But, with baby on the way and hubs traveling, it's looks like we won't be able to vacation this year. I'm not thrilled about that, since I really could use a break from reality! What about you? 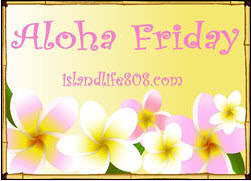 For more Aloha Friday fun visit Kailani at An Island Life. I don't have any summer plans yet! I don't think I'll go anywhere this year either! I'm sorry that it looks like you won't be able to get a break this summer! Have a great weekend! We will be going to Florida sometime this summer. We just baught a beach house with a few friends so that will be nice this year! Nope. We vacation during the off-season due to work schedules. We don't have any vacation plans this summer. We are saving up for next summer. We are actually thinking of going to Holland to visit relatives and then off to visit my mom in South-Ameria (yep, we will have a bus summer) which is great. Don't see them often but we try to visit once a year! We are going on a week long Eastern Caribbean cruise in July, I am so excited!! No, any plans yet. Hope soon we plan something is not is going to be a worry summer,ha. We are planning to go north and south. summer is almost over for us here in the Philippines... :) it is back to school in June!